Nirupama Kumar created this gorgeous layout, pulling out all types of artsy technique. 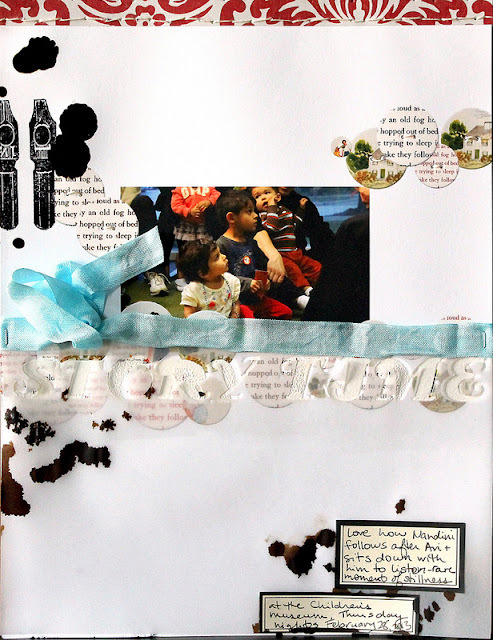 She inked and stamped and cut vellum and added seam binding to her layout featuring a photo of her little one in Storytime. To make the title, I cut a sheet of vellum with my Silhouette. To add texture and make the title more visible, I used the cut piece as a stencil and pressed versamark onto the background paper. I sprinkled on some white embossing powder and heat set it. Then I stapled the vellum piece back on top. Niru shows us how you can combine digital elements with all types of supplies on a hybrid layout. Why not give it a try?! LOVE this Niru! Thanks for the inspiration! Try our new Digital Reader Buttons today - they're 25% off this weekend! Those buttons are the cutest! Lovely layout too!!! !